The central tenet of socialism is “abolishing of private property”, at least in so far as it can be used in trade and commerce. It is important not to conflate social policy with socialism, a category mistake. 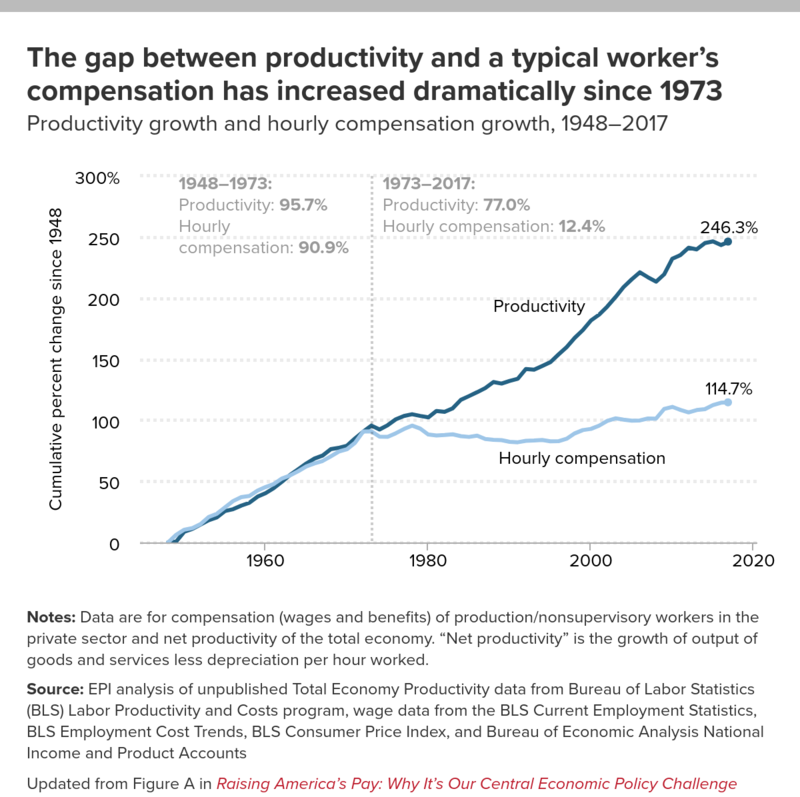 The comparison of productivity vs hourly wage is nearly meaningless without accounting for the standard of living on that wage. The problem of capitalism is of a different kind. Excessive accumulation of capital in few hands is anticompetitive, and this in turn is one of the fundamental tenets of capitalism, so, in essence, the problem is not ‘too much’ capitalism but ‘not enough’ of it, or bastardisation of capitalism by the elites wh are now actively trying to destroy capitalism in order to accomplish absolute power for themselves. Socialism is a convenient springboard for such a change, as socialism for the masses, all equal in their destitution, and absolute power for the Central Comittee of the elites. Curiously, after the fall of socialist order in Poland, the communist elites and military brass, provided they did not commit serious crimes (other than exploitation) become the leaders of the new Poland, presidents of leading institutions, various authorities (including the Central Bank). I am nonetheless optimistic about capitalism, because its problem can be narrowed down to one property which can be hypothetically fixed: credit. In order to fix capitalism we only need to nationalise bank credit, and the system is bound to become more equitable while profits from credit (interest) would provide a huge revenue boost to the public purse, equivalent to a 20% tax rate on income. People adept at failure imagine socialism is just about getting 'free stuff', forgetting the other side of the equation where you don't get to keep your own stuff. There is no such thing as economics. There are TWO fundamentally different types of economics: political economics and theoretical economics. The main differences are: (i) The goal of political economics is to successfully push an agenda, the goal of theoretical economics is to successfully explain how the actual economy works. (ii) In political economics anything goes; in theoretical economics, the scientific standards of material and formal consistency are observed. For non-economists, the most important thing is to realize is that theoretical economics (= science) had been hijacked from the very beginning by political economists (= agenda pushers). Political economics has produced NOTHING of scientific value in the last 200+ years. Economics is a failed science. The four main approaches ― Walrasianism, Keynesianism, Marxianism, Austrianism ― are mutually contradictory, axiomatically false, materially/formally inconsistent, and all got the foundational concept of the subject matter ― profit ― wrong. As a result, since Adam Smith/Karl Marx economic policy guidance NEVER had sound scientific foundations. Economists of all colors sell proto-scientific garbage in the bluff package of science. • Marxians are scientifically incompetent just like non-Marxians and all together are only employable as useful political idiots. Because both Capitalism and Socialism have no sound scientific foundations, their respective economic policies are not much more than blind political agenda pushing. Never forget that both left-wing and right-wing economists do NOT know what profit is and how the actual monetary economy works. #4 Ricardo, too, got profit theory wrong. Sad! #7 MMT ― backstop or advanced life support for the Oligarchy? Terms like socialism have a lot of emotional baggage attached, particularly in a society like the US founded in part by Puritans and other religious fanatics, and by free-boosters whose only aim was wealth by any means necessary. So, let’s remove the term from our discussion. The real issue here is democratic control. As liberals once understood, maintaining democratic control in the US is never ending work. Some group, cult, class, etc. was always attempting to undermine democratic control to their own benefit. The anti-democratic faction that most worried many of the signers of the Constitution is the “monied-class.” They worried this faction could use their ownership of factories, rations, natural resources, etc. to threaten the economic wellbeing of ordinary Americans and thereby force Americans to betray democracy. Take the American population hostage, in other words. American radicals later came up with a name for this process, wage slavery. Upton Sinclair summed up the problem in these words, “It is difficult to get a man to understand something, when his salary depends on his not understanding it.” Guess what, these early Americans were correct. We’re now living in the hostage society predicted by them. How do we fix this? We need to rebuild a strong democratic government and then push it to restore democratic control. In terms of history it is social movements that have generally carried out this pushing. Social movements created a nation while the American Revolution was under way, made the abolition of slavery a national issue before the American Civil War, forced prohibition on the nation, led America into both World War I and World War II, forced the American government to abandon the War in Vietnam, led the way in forcing changes for American laborers, etc. And now we need social movements in the US to force government back within the bounds of the Constitution, including taking strong measures to control the increase of economic and political inequality within the nation. The citizens of the US began this process after the election of Donald Trump and continue to increase the pressure on Trump and his followers to behave properly or be forced from office or even American citizenship. American citizenship is not a right. Citizens forfeit it by abuse.